DJI went to great lengths to miniaturize much of the technology found in the Mavic Pro to fit in into the Air. Power in this case includes both aircraft power and camera power. The Mavic Air has a 21 minute flight time and a range of up to 2.5 miles (when used with included controller). You can even take off at altitudes up to 16,404ft. MSL, although it is unlikely you will see the 21min endurance at this height. Stability is also said to be improved with the ability to withstand 22mph winds and cruise at a brisk 42.5 mph. While these capabilities are comparable to the Mavic Pro, it is worth considering that this stability has been achieved in a much smaller form factor. With regards to the power of the camera, Where the Spark was an iPhone 5s attached to a drone, the Mavic Air is closer to a Pixel 2 attached to the same drone. The sensor size is the same as the Pro at 1/2.3″, The Mavic Air will still only shoot 12 MP stills, but it will now do so in greater quality due to the inclusion of HDR. The video capabilities have been improved as well, vastly eclipsing the Spark and even besting the Mavic Pro in many areas. The Air will shoot 4K video at 30fps (same as the Mavic Pro) (or Full HD @ 120fps) but users can expect higher quality video due in large part to the improved bitrate of 100 Mbps which is up from 60 on the Pro and 24 Mbps on the Spark. DJI also included some new photo and video modes like Spherical Panoramas, Asteroid, and Boomerang which they demoed. The panorama feature mimics the feature set of software like PTGui and stitches 25 photos together to create a stereographic projection (or globe panorama) as well as 32 MP spherical panoramas. All the video and stills can be saved to a MicroSD card, or to the 8GB of onboard storage and transferred to a computer using the USB-C port on the Air. On paper, the Mavic Air seems like a clear improvement over the Spark and a marginal improvement over the Pro. DJI is leaning heavily on the portability of this unit, positioning it as a full-featured 4K shooter that you can put in your pocket. At just under 1lb., the Air weighs only 130g more than the Spark and tips the scales at 304g (.67lbs) less than the Pro. Perry demonstrated the portability of this drone by pulling two Mavic Airs and associated controllers out of his hipster-esque vest. This really drove home the reduction in size (about half the size of the Mavic Pro) and weight (41% less than the Mavic Pro). While the name suggests this is an upgrade to the Mavic Pro, others would suggest that this is more of an upgrade to the Spark due its extreme portability. When folded, the Air is shorter (both in length and height) than the Pro and be easily fit into a bag, jacket or cargo pocket. 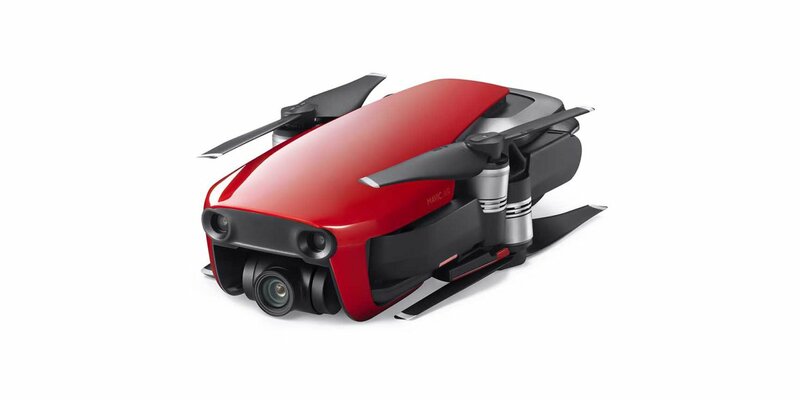 Most reviewers agree that this is the drone you can and want to take with you. The Mavic Air fills an interesting place between the Spark and the Mavic Pro. DJI seems to believe that the Air can do everything the Mavic Pro can but in a much smaller package Indeed, on paper at-least, it competes or even bests the Pro for video, stills, and collision avoidance in a much more portable frame. At $799 for the base package, or $999 for the ‘Fly More Bundle’, it’s not the impulse buy or ‘toy drone’ that some considered the Spark to be. However, if you are an adventure photographer or just someone who likes to pack light, still wants to get stable 4K video, and is ok with a slightly reduced endurance, the Mavic Air might be a way to save a few pounds in your pack. Preorders for the Air are now live with delivery and a limited retail release scheduled to start as soon as Jan 28th. Want more? Check out our first look at the Mavic Air here.